A new SUV has been unveiled by the Spanish automaker, SEAT. 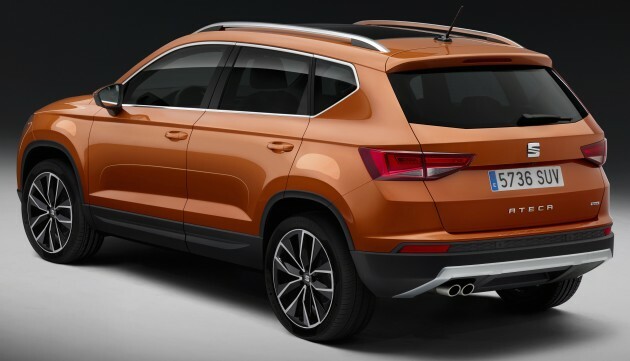 Called the SEAT Ateca, the vehicle takes some design cues from the SEAT Leon, and is the first-ever SUV by the brand. The Ateca will be available in three trim levels, with the Ateca Xcellence being the top-of-the range model. Design-wise, the Ateca sports a trapezoidal grille, side blisters with sharp creases and signature triangular lights, similar to the SEAT Leon. At the front, the company says that the Ateca is “100% SEAT and yet 100% SUV.” It features large high grille brims and a large air intake, that when combined with the edgy headlamps, give off a muscular stance. Furthermore, the Ateca comes with “welcome lights,” which sees LEDs fitted in the door mirrors. It will project the Ateca’s name onto the ground when unlocking the car. Full LED headlights can be opted for as well. In brief, the Ateca measures 4,360 mm in length, with a boot space of 510 litre in standard configuration or 485 litres for the all-wheel drive variants. Inside, the cockpit features a horizontal line that’s driver-focused. Controls are clustered closely together, while a high centre console stands out. The Ateca also comes with a shortened gearstick, to give off a sporty feeling. In the centre console sits a Connectivity Box that allows for wireless charging of smartphones. Technology-wise, SEAT Drive Profile is available. It enables the Ateca to adapt to current driving situations, road conditions and additionally, it caters to individual preferences. To add to that, the SUV comes with Easy Connect infotainment systems, SEAT Full Link and SEAT ConnectApp: Media System Plus, where an eight-inch touchscreen is the main highlight. Said to be agile, thanks to the “intelligent lightweight design” of the body shell, SEAT says that the SUV is incredibly stiff too. Driver assistance tech includes Traffic Jam Assist, Emergency Assist, Adaptive Cruise Control with Front Assist, Traffic Sign Recognition, Blind Spot Detection, Rear Cross Traffic Alert and Top View Camera. The range of engines – all turbocharged – include petrol variants, where a 1.0 TSI with 115 PS starts the range, while a 115 PS 1.4 TSI that comes with cylinder deactivation is the second option. As for the diesel mills, a 115 PS 1.6 TDI, and a 2.0 TDI is available with 150 PS and 190 PS. The Ateca is available in front- or all-wheel drive configurations, while a manual or dual-clutch DSG transmission can be opted for. Very Audish but good since under the same family…too bad Seat not available here. Next Post: Ford Fiesta ST – powered up version on the cards?